Between 2006 and 2008, we led a multi-stakeholder process in Latin America to develop a collective vision and principles for responsible artisanal and small-scale mining (ASM). These provide the foundation upon which we went on to develop Standard Zero, the world’s pioneering standard for responsibly mined gold and associated silver and platinum. In 2009 based on Standard Zero, the first version of the Fairmined Standard was developed in partnership with Fairtrade. In April 2014, after a transparent revision process with open forums involving a broad range of stakeholders including the whole supply chain, version 2.0 of the Fairmined Standard was released. The Fairmined Standard has been received by the miners, the gold industry, governments, and civil society as a robust and credible standard. 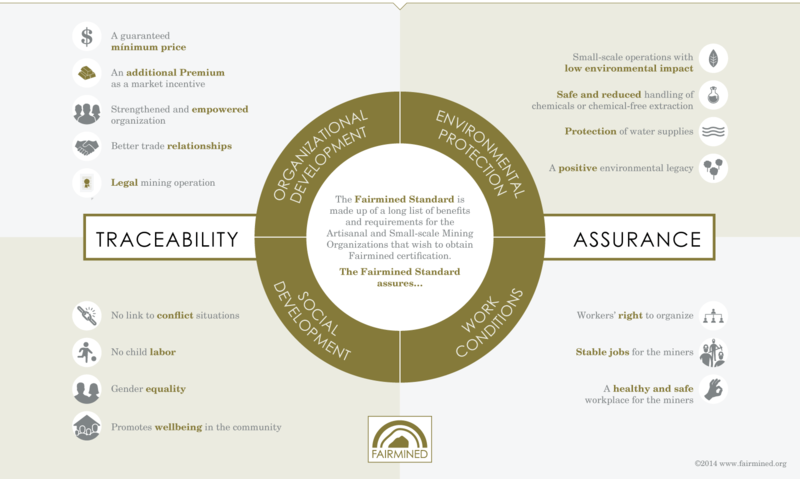 The Fairmined Standard is world leading in its ability to deliver positive impact to the miners and their communities and is a valued tool to transform artisanal and small-scale mining into an active force for good. We have developed the Fairmined Standard for Gold and Associated Precious Metals to support sustainable development of artisanal and small-scale mining communities. The standard includes requirements for artisanal and small-scale mining organizations to perform responsible artisanal and small-scale mining: formal and legal mining operations, environmental protection, labor conditions, traceability of Fairmined minerals, and socio-economic development through the Fairmined Premium. It also outlines market models and requirements for market actors (Fairmined Suppliers). 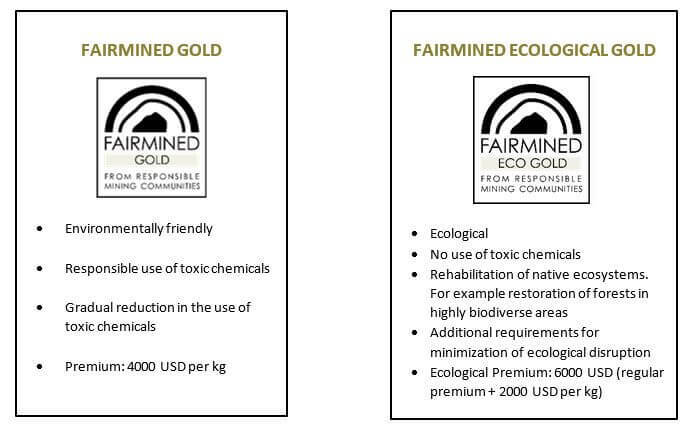 Fairmined Ecological Gold is produced under the same strict standard for responsible mining as Fairmined Gold in terms of social, organizational and economic criteria. But there is one difference. Where regular Fairmined Gold is produced with responsible management and reduction of toxic chemicals like mercury and cyanide, miners producing Fairmined Ecological Gold do not use any toxic chemicals at all in their extraction processes. Fairmined standard for gold from artisanal and small-scale mining, including associated precious metals (V1.1 ARM 1st May 2013 superseded by the new version 2.0).